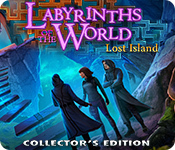 Labyrinths of the World: Lost Island Collector's Edition is rated 4.1 out of 5 by 16. Rated 5 out of 5 by yowzasma from A TOTALLY ENJOYABLE GAME : ) I just completed this great game. I found it to be a very relaxing time while playing. I bought this game because of the 4 & & 5 star reviews and am appreciative of my fellow Fishies that give such informative information. I am most always impressed by these Developers because of the TLC they seem to put in their games [ I have 7 of the Labyrinths of the World: games starting in 2014 ]…. There is usually a touch of humor and the voice-overs were very good. The characters are individuals and not copies of one with different faces. The hops and minis were pretty good but imho there are rarely enough hops : ( So if you are considering playing this I really don't think you will be disappointed especially if you enjoy fantasy games. So I'm really rating this one a full 5***** out of 5***** on my personal enjoy-ability list . Rated 5 out of 5 by Marja67 from Love this Series. Beautiful graphics, good story. Lots of collectibles. Want more of these for sure. Rated 5 out of 5 by dancemom1 from My world, not yours! Hello friends! As usual, I review mostly on the game play and leave the story line to others. Is this really #9 in this series? Graphics were fairly clear, although we did have a little blurring when going in and out of closeups. Colors were bright, but not over powering, and we did have a lot of blues mixed in as well. Voices were age and character appropriate and spoke with some realism, e.g., anger, fear, urgency, etc., and not just someone reading a script. Animation was very well done, with eye and mouth movements matching what is being said and/or done at the time. Game play was good, no problems during the demo. Music was rather soothing and mostly for back ground noise. Sound FX are very well done and are throughout game play. During the demo, I did not run across a "little helper" in this one. Please be aware that there are very bright lights when traveling through portals. Fortunately, not that often. HOG's are very well done and varied. We have a combination of highlighted words, interactive lists, matching parts of pictures, and straight lists. You can switch to a Match 3 for something different now and then. Scenes are fairly clean and items are not difficult to find. Puzzles are nothing new, but we can choose the difficulty. Even is easy mode, some of them take a bit of time and thought to complete. Hint system is very helpful, and transports you to the map when you need a hint. This is my favorite map. All areas are shown and clearly identified with location name, and whether there is a missed collectible still to be found in that location. For the adventurous type, you can choose not to have that particular hint show up on the map. It takes 15 seconds for the hint meter to fill...personally, I think 10 seconds if plenty long enough. Collectibles are well done and many. We have to find 69 tokens. So far, I have only found one in each scene, but with that many, it could double or triple as the game progresses. These are not easy to spot, as they blend into the scene quite well. We also have 21 card that give us info on characters. These are not in every scene and are often quite small and easy to miss. The last collectible is what they call "articles." They are actually wanted posters for the bad guys. We need to find 15 of them. These have been fairly easy to spot. I really like this series and this addition is no exception. No, the story is nothing new...bad guy on the loose, trying to conquer the world and we need to stop him. However, the story is well done, flows well and is easy to follow. This addition is not exceptionally challenging, but there is enough action to keep you moving and not get bored. I think all levels of players will find this one entertaining and worth the price of a CE. I gave this one a 4.75 on my scale. Yes, I am adding it to my collection of CE games. As always, try it for yourself and see what you think. We all have different tastes in games and you may not like this one at all. Thanks for the reviews. Play on! Rated 5 out of 5 by Majestyx12 from How far will you go under hypnotism? I play as Margaret, a seeker who can go to different worlds. The weather is now extreme cataclysms. Starting to follow the person responsible leads me to the Bermuda Triangle. The journey begins. Collect 69 tokens (to me look like dog tags) to buy animals for your Magic Zoo. Collect 15 wanted posters and 21 cards. I like how colorful the game is and I had my share of monsters and evil spirits lately so this is refreshing. Liked the different places I went. I was playing and look up and hours went by. The thing I would change would be more list hops and less of the story or this + that hops. 33 Cutscenes, Replay 18 hops, 20 mini-games and 5 music. 17 wallpapers and 20 concept art. Rated 5 out of 5 by biscuitsmama from LABYRINTHS OF THE WORLD LOST ISLAND HITS THE MARK! 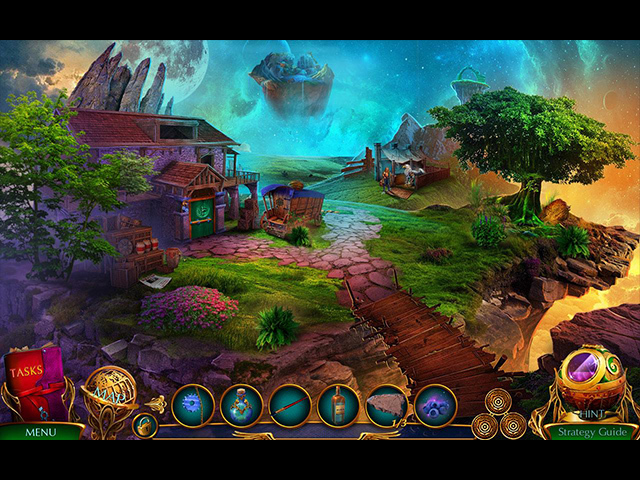 Labyrinths of the World is back with Lost Island the ninth game in the Labyrinths series. This has been a series that is somewhat on and off for me but fortunately, to start 2019, this is one of the better games. In Lost Island Margaret who is fairly new at this seeker business will have to go it alone without her brother and fellow Seeker Simon has gone missing. Not only is Simon missing Earth is facing cataclysmic disaster from Dietrich who has managed to escape from a Seeker prison. Yes folks this is another game with yet another madman bent on destruction and control but in spite of the “we’ve been there, done that” storyline it is an excellent game with some great HOS and puzzles. 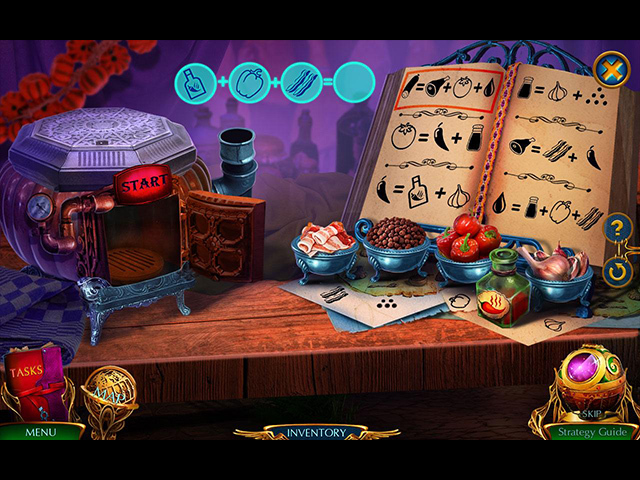 The HOS in the game are very creative and well-integrated into the storyline as are the overabundant puzzles. Lately I’ve been on a rant about far too many puzzles in HOPA games and even though Lost Island has an almost two to one ratio between HOS and puzzles I found that this game “worked”. Recently it seems that puzzles have been slapped into a game by developers in order to stretch the game when in reality they have, at least for me, taken the fun out of playing. 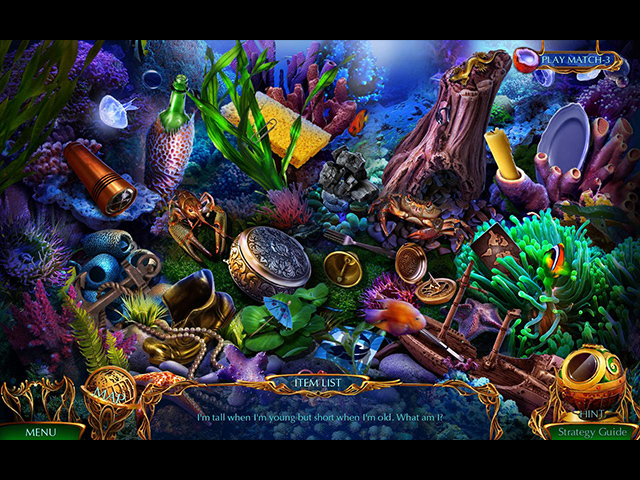 However, in Lost Island the HOS and puzzles worked together to create an excellent game and with the puzzles fitting seamlessly into the storyline and gameplay. While other developers seem to be cutting down on game size, Domini always creates long games and Lost Island is no exception. There is no skimping on the content or the extras with this developer and if you love the series then Lost Island is a game you will most likely enjoy. As is the case with most games now there is a Custom Mode of gameplay in Lost Island. It is another of my pet peeves that if a developer offers a Custom Mode then it should be FULLY customizable otherwise the gamer can select one of the other modes. It rather irritates me that developers set the hint and skip bottom time limit for us. If a game is customizable then the hint and skip ranges should begin at “0” seconds rather than “15” seconds. Since I tend to be rather impatient I hate to wander aimlessly for the hint meter to reset when I need a hint to move forward. PLEASE developers allow the gamers to select their own hint and skip times in the Custom Mode of gameplay. The HOS in the game are excellent and very well-designed and because I don’t want to spoil your fun I will simply say that Lost Island has some of the best HOS that I have seen in a long time. Even though I dislike having far too many puzzles in a game, I really enjoyed those in Lost Island. This developer offers an option to select between the “Easy” and “Hard” setting for playing most puzzles. If you select the hard setting at the beginning of the game you still have to option to change it for each puzzle you play. One of my favorite puzzles was early in the game where we had to align crystals with their matching positions. The puzzle seemed to set the tone of the game and I found myself thoroughly enjoying each one I encountered. Thank you BFG and Domini for bringing us a great new Labyrinths of the World game. Lost Island is one of the best HOPA games I have played in quite some time. I’ve been looking forward to this game since playing the beta, and the final CE does not disappoint. This is a beautiful game with a good storyline and a lot of entertainment value. Even though Labyrinths of the World Lost Island is a perfect game for me, please try the demo to see if it is a game you will enjoy. Happy gaming! Rated 5 out of 5 by sunnyglow from BECOME “ENTRANCED” ENTERING PORTALS TO OTHER WORLDS REVIEW BASED UPON THE ENTIRE GAME 7 Chapters Plus a Bonus Chapter – Strategy Guide: 56 Pages OVERVIEW: Margaret! Are you ready to save the world? The earth’s crust has developed a crack, causing chaos and destruction. The evil Dietrich, a master hypnotist, has escaped from the Seekers’ Prison and has kidnapped your brother, a fellow Seeker. He has put your brother into a hypnotic trance, using him to locate the Heart of the World, an artifact which keeps the earth in balance. His plan is to use this artifact along with the three hearts from the other worlds to destroy the energy net of the Seekers, preventing them from using their teleportation abilities. Dietrich will then be able to travel anywhere in the universe, escaping capture. Now you are off traveling to the other worlds to apprehend him. Can you stop him in time before your world is destroyed? OPINION: This is a long, creatively designed game. As with their other games, Domini provides more game for the money, providing extras not found in many other games including more collectibles, more chapters for a longer game, more puzzles, and a choice in difficulty for those puzzles. The pace is excellent with a decent story and plenty of activities to keep the player engaged. For me, the graphics are better than in previous games. Domini has toned down the vivid purple and neon green evidenced in many of their other games. Some of the graphics are breathtaking, especially in the chapter dealing with the Aerial World. For me, this game is better than the previous ones from this series. MECHANICS: There are four (4) levels of play including a customized version. There are thirty-three (33) achievements. Collect sixty-nine (69) tokens to purchase strange animals for a Magic Zoo. You also collect twenty-one (21) cards of characters from the various worlds and fifteen (15) “Dietrich Wanted” posters. There is an indicator bar on the inventory bar which alerts you when there is a collectible within the scene. I found most easy to locate. You can choose the difficulty for the puzzles in the menu; a choice between “easy” or “hard” modes. There are seventeen (17) wallpapers along with concept art, music and video sequences. You can replay twenty (20) mini-games and eighteen (18) HOP scenes. BONUS CHAPTER: It is a story not related to the main story. The prison guard at the Seekers’ Prison has asked for your help in retrieving the Portal Brush, a brush used to draw portals to other worlds. Grimmor, a dangerous criminal, has stolen this artifact and you must stop him before he creates a world in which he and other criminals can escape. This is a long chapter. There are nine (9) mini-games and five (5) HOP scenes within this chapter. You continue to search for collectibles within this chapter. I found some of the puzzles and HOP scenes better than those in the main game. HOP SCENES: There are eighteen (18) scenes within this game. You can replay all these HOP scenes after you complete the game. There are also several mini-HOP scenes in which you collect a small number of some item. They are some of the most creative scenes I have seen from this developer. They include lists of items, silhouette, and storybook scenes; however, they also include matching scenes and a scene with rebus clues and one with cryptic clues. The bonus chapter has one scene which contains morphing objects. You can play a Match-3 game in lieu of the puzzles. My favorites include one in which you must rotate three circles to create the items to be removed. For those music lovers out there, there is one in which you search for musical symbols while changing the scene using three colored keys on a piano. In another scene, which is similar, you switch scenes using three colored lenses while searching for items. MINI-GAMES: There are thirty-eight (38) puzzles within the game. Most of the puzzles have the option to be played in either an “easy” or “hard” mode. I found most the puzzles also creatively designed. There are quite a few map puzzles and lock puzzles within this game. However, demonstrating the creative talents of this developer, the map puzzles and the lock puzzles differ from each other in some aspect. SPOILERS: HERE ARE SOME OF THE PUZZLES AFTER THE DEMO: A. Map puzzle. Move a set of footsteps through an unlit labyrinth, picking up items to help you overcome obstacles. B. Assembly puzzle. Choose a pair of hands, which, when combined, will create a shadow figure of a given animal. Do this for six (6) animals. C. Connection puzzle. Connect six star-shaped spheres with each other so that the number of connections for each sphere equals the number of the center within the sphere. D. Mathematical puzzle. Using knobs with plus and minus numbers upon them, use them to move a red line so you end at a designated number on a thermometer. E. Physics puzzle. Ye Old Mirror Puzzle. In this case, angle 3 beams of light moving crystal lenses so that the light beams hit three lamps on the left side of the screen. BONUS CHAPTER: F. Assembly puzzle. Prepare sausage by following instructions in a book and pressing start to see if the combination is correct. G. Sequence puzzle. Click on symbols according to pieces of paper which have years written upon them. The symbols must be chosen according to the year from earliest to the latest in sequential order. Rated 4 out of 5 by Helen1st from old ladies? I haven't finished this yet, but I just wanted to say something about voices. Why does Davona, who looks to be in her thirties at most, sound like an old lady? This female voice actor seems to be a favourite, but I don't know why. She is used to voice lots of women who should sound strong and vital, she sounds as if she needs a good sleep and her dinner liquidised. I did comment once on the voice actor for the intro of the Myths fo the world series. He sounded like he needed new dentures - they replaced him. Please,u se this lady for old women and even witches, but not strong vital characters. Having said that, the story seems true to the genre and a pleasant way to suspend belief and real world logic, and pass a few moments.